"Make the units better with new technology. Make more of them. And make them cheaper." The SPARTAN-III program was a top-secret project initiated by the Beta-5 Division of the Office of Naval Intelligence's Section Three in order to produce cheap and expendable supersoldiers to stem the tide of the Covenant's onslaught against the Outer Colonies. 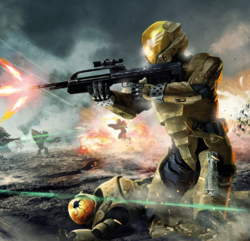 In active service between 2536 and 2552, the Spartan-IIIs turned the tide of several critical battles of the Human-Covenant War. After the war, the remaining Spartan-III personnel were given the opportunity to join the newly formed Spartan Operations, supplementing the numbers of the Spartan-IVs. The SPARTAN-III project was both a successor and supplement to the SPARTAN-II program. Created and engineered by Colonel James Ackerson of the Office of Naval Intelligence, the Spartan-IIIs were to be the next generation of supersoldiers. Composed primarily of vengeful orphans from fallen colonies, they would be cheaper to arm, train, and produce; being chosen from a wider pool of candidates, they would also be more numerous than their Spartan-II predecessors. They would rely more heavily on teamwork and sheer numbers than advanced technology and equipment to achieve effectiveness. The SPARTAN-II program had been a dazzling success for the UNSC. Tales of Spartan supersoldiers fighting off thousands of Covenant attacks had become the stuff of legend. Unfortunately, there were too few Spartan-IIs to turn the tide of the war. Worse, the program's director, Dr. Catherine Halsey, had postponed the training of new Spartan-IIs for years due to the specific age selection criteria, despite having candidates who met the genetic requirements. The SPARTAN-II program also had several problems and deficiencies which overshadowed its success to the Office of Naval Intelligence. Firstly, the high mortality rate of the children during augmentation was counterproductive to the goal of the program. Next, funding the Spartans, including their training and Mjolnir armor, cost as much as a battle group, at least according to Rear Admiral Ned Rich. Third, there were far too few of them for them to turn the tide of the war. Finally, even though the SPARTAN-II program was not formally revealed to the public until 2547, the Spartans and their exploits had already attained a near-legendary status within the UNSC. Even though the Spartans provided huge morale boost to the UNSC, it was a problem for most of the Office of Naval Intelligence. ONI operated in secrecy, and anything that shone light on their operations was seen as detrimental to their efforts. The Spartan-IIIs were designed to be cheap and expendable. Trained in companies of around 300 at a time with a training regimen tougher than that of the SPARTAN-II program, they were ultimately sent on high-risk missions that the UNSC could not accomplish even with the elite Orbital Drop Shock Troopers. Though the casualty rates of the Spartan-IIIs stood at 100 percent on some missions, to ONI, all the operations were strategic successes. They were trading lives for time against the larger and technologically superior Covenant. ONI hoped that in time, enough Spartans would survive to train progressively more future Spartans, swelling the ranks of available supersoldiers from only 30 Spartan-IIs in 2531 to roughly 100,000 Spartan-IIIs within two decades. However, this ultimately never came to pass due to budgetary restrictions and the SPARTAN-III augmentations being compatible with only a small percentage of the population. Members of Alpha Company being inspected by one of their trainers. On December 27, 2531, the first group of Spartan-IIIs, known as Alpha Company, was sent to Onyx to be trained at Camp Currahee. They were led by Kurt Ambrose, a Spartan-II who had been abducted by ONI to administer the program. Of the 497 candidates who were conscripted, only 300 became Spartans. This class of Spartans all survived the augmentations and was activated in November of 2536. Their record was at first exemplary, as they saw action at the Mamore, the New Constantinople, and the Bonanza Asteroid Belt. Nine months after activation, Alpha Company was deployed on Operation: PROMETHEUS, a mission to destroy a Covenant shipyard on asteroid K7-49. All 300 Spartans deployed on the mission were killed. However, Ambrose and Mendez had extracted a number of Spartans from the general population of Alpha Company before Operation: PROMETHEUS. These Spartans were assigned to other units, sometimes within other branches of the military. Many were issued Mjolnir armor. At least six of these Spartans remained active as of early 2552: Carter-A259, Jun-A266, Emile-A239, and Thom-A293 (all of whom served on NOBLE Team) as well as Rosenda-A344, Hazel-A302, and Kevin-A282. Beta Company was approved right after Operation: PROMETHEUS in 2537. 418 candidates were conscripted in 2539, from whom the final company of 300 was formed. Disheartened at the loss of Alpha Company, Ambrose used a tougher training program and more thoroughly trained them in unit cohesiveness. Despite their superior training, they were similarly massacred in Operation: TORPEDO in 2545. From the entire company, only two participants survived the battle: Tom-B292 and Lucy-B091. As with Alpha Company, several members of Beta Company deemed too valuable to be wasted on suicide missions were pulled out of the unit before Operation: TORPEDO. Some of them were initially assigned to non-combat roles as cover, much to Colonel Ackerson's dismay, as he wanted to have all available Spartans in the field. Like the personnel extracted from Alpha Company, they were issued with special equipment such as Mjolnir. These included Kat-B320 and SPARTAN-B312, both of whom later served on NOBLE Team, as well as SPARTAN-B170. Olivia-G291 with Fred-104 and Special Inspector Veta Lopis in Gao's Montero Cave System, with Ash-G099 and Mark-G313 in the background left. Gamma Company was trained with the help of the only two Spartan-IIIs from Beta Company who survived Operation: TORPEDO: Tom-B292 and Lucy-B091. Lieutenant Commander Ambrose regarded Gamma Company as the finest of the SPARTAN-III companies. 330 candidates were selected, on average only six years old, and at Ambrose's request all 330 were approved for graduation. Every one of them survived the augmentation procedures. Gamma Company received deployment orders only a few weeks after the Fall of Reach and most left Onyx before the Onyx Conflict occurred. Only fifteen Spartan-IIIs of Gamma Company remained on Onyx as they competed for top honors. Following the battle, seven had been killed in action. Team Saber was the only Gamma Company team to fight alongside the Spartan-II unit Blue Team. With the help of their older, more experienced counterparts, they successfully fought off a Covenant attack along with destroying a Sentinel manufacturing facility. Ultimately, the surviving Spartan-IIIs escaped to the shield world at the core of Onyx. After the Human-Covenant War, the main body of Gamma Company was integrated into the newly formed Spartan Operations branch, though some members were returned to non-combatant status. The Spartan-IIIs on Onyx (having joined Blue Team) were later recovered by the Office of Naval Intelligence. They continued to serve with Blue Team until July 2553, when Admiral Margaret Parangosky decided to reassign the three Gamma Company Spartans into a top-secret "Ferret" unit while officially listing them as KIA to prevent knowledge of their illegal enhancements. The Ferret team later worked with Blue Team again to stop a bioweapon plot. SPARTAN-G059 remained in active service and was deployed on a mission to assassinate Avu Med 'Telcam on January 2558. Delta Company was proposed and Camp Currahee was being prepared for the candidates' arrival when the Battle of Onyx began on October 31, 2552. With the death of Lieutenant Commander Ambrose and the disappearances of SCPO Franklin Mendez and Dr. Catherine Halsey, as well as the immediate concerns of the Battle for Earth and the SPARTAN-IV program, it is highly unlikely that Delta Company was ever trained. In addition to the standard company formations, many Spartan-IIIs were withdrawn after training to serve in specialist units. Most of these Spartans served under the operational command of the Navy and the Army, though some served in the Marine Corps, and a select few in the Air Force; ONI's Beta-5 Division considered specialist Spartan-III teams useful bargaining chips in the internal politics of the UNSC Armed Forces, using them to achieve ends relevant to their interests such as securing given branches' leadership support for the program. Alpha and Beta Companies initially had 497 and 418 candidates, respectively, although only 300 would become Spartans within each company. Of the "washouts" from these companies, most would later become drill instructors for their successors. However, there may still have been a large recruitment pool from which to draw members for specialist teams. At least six Spartans — Emile-A239, Carter-A259, Jun-A266, Thom-A293, Kevin-A282, and Rosenda-A344, were culled from Alpha Company, though the extent of these personnel withdrawals is unknown. Lieutenant Commander Ambrose believed that as much as 1.08% of Beta Company could be folded into base personnel prior to the attack on Pegasi Delta, which was expected to be a bloodbath: SPARTAN-B312 was pulled immediately after training and deployed as a "lone wolf" by an unknown superior; Kat-B320 was extracted (with difficulty) after Operation: CARTWHEEL and assigned to NOBLE Team. Ambrose also attempted to send Lucy-B091 and SPARTAN-B170 on deep, long-term reconnaissance to keep them away from Operation: TORPEDO; Lucy ultimately participated in the battle, though B170's fate is unknown. Rosenda-A344 served in the non-company personnel rotation and was considered as a possible replacement for Emile-A239's position as Noble Four due to the latter's excessive hostility toward Insurrectionists. With Gamma Company, all 330 trainees officially graduated as part of the company, although the three best-ranked teams were set apart from the main body of the unit and remained on Onyx for additional training exercises even as the rest of the company was deployed into combat. Jonah-B283 and Roland-B210, a Headhunter team. Only Spartan-IIIs who had survived two or more specially assigned training missions could join the "Headhunters". These two-man teams of Spartan-IIIs went on missions far behind enemy lines and were typically expected to die in combat. The Headhunters' existence was secret even to their peers. Once selected, candidates for the program were separated from their fellow Spartans and sent to specialist training camps on the far side of Onyx. The Headhunters were comprehensively evaluated in order to ensure an effective bond between the members of each team. A contingent of six two-man teams, as well as five additional Headhunters, was maintained at all times to ensure the program's numbers remained constant should one or both members of a team be lost. At least two Headhunters, Jonah-B283 and Roland-B210, wore SPI armor that was more advanced than the suits issued to most Spartan-IIIs: it included energy shielding, motion trackers, and VISR technology, and could also support a prototype active camouflage module. The Headhunter program remains active following the establishment of the Spartan branch, albeit with some organizational changes. Out of those Spartan-IIIs withdrawn from their companies, many were equipped with MJOLNIR Powered Assault Armor and deployed similarly to the Spartan-IIs rather than on suicide missions like their peers. These Mjolnir-clad Spartan-IIIs played a crucial role in many battles throughout the war in every branch of the military. Since the public was not aware of the distinction between the Spartan-IIs and the Spartan-IIIs, the latter let their predecessors take credit for their actions. Many Mjolnir-clad Spartan-IIIs defended the planet Reach during the Covenant's invasion of the planet. Gauntlet, Red, and Echo Teams were rumored to be deployed in civilian evacuation operations on August 23. Concurrently, an unknown number of both Spartan-IIIs and Spartan-IIs were deployed to the capital city of Casbah on Tribute. A Spartan-III fireteam held off a bevy of Covenant vessels while a small number of civilians escaped aboard a transport craft. Though the entire team was killed, the Spartan-IVs on UNSC Infinity would later pay homage to their courage with a simulation of the engagement. By 20:00 hours on August 30, thirteen Spartan-IIIs had perished near the Aszod ship breaking yards, the last evacuation point on the continent of Eposz; soon, SPARTAN-B312 of NOBLE Team would die in the same location in a valiant last stand. NOBLE Team was a special operations fireteam of the UNSC's Special Warfare Command. Unlike the Headhunter program, NOBLE Team was entirely separate from the SPARTAN-III program, being made up of Spartans extracted from both Alpha and Beta Companies and serving under the Army's operational jurisdiction. Composed of five Spartan-IIIs and one Spartan-II, NOBLE Team was issued Mjolnir armor rather than the Semi-Powered Infiltration armor issued to most Spartan-IIIs. Their most notable combat deployment was during the Fall of Reach. The team was commanded by Carter-A259, with Kat-B320 as his second-in-command. All but Jun-A266 were killed in combat during the Fall of Reach. NOBLE Team's sacrifice was later commemorated with a statue at Hősök tere in the city of New Alexandria on Reach. The operational history of the SPARTAN-III program has been marked by success and tragedy. Many of the operations undertaken by the soldiers were suicide missions, but were regarded as successes by the UNSC. October 24 — Colonel Ackerson' proposal for the SPARTAN-III program is approved. December 27 — Alpha Company begins training. October/November 2536 — Alpha Company finishes training and is deployed into combat. Alpha Company quells an insurrection on Mamore — Success. Battle of New Constantinople — Success. Operations in the Bonanza asteroid belt — Success. Operations on the Far-gone colony platforms — Success. Six other successful battles in which Alpha Company participated. Candidates for Beta Company are selected. In July 2537, Beta Company is formed. July 27–August 2, 2537 — Operation: PROMETHEUS — Pyrrhic success; all participants confirmed KIA. July — Gamma Company is activated. Beta Company is deployed at some point prior to May 2545. July 3, 2545 — Operation: TORPEDO — Pyrrhic success; all but two participants confirmed KIA. February 2551 — The 330 Spartans of Gamma Company are augmented aboard UNSC Hopeful. Sometime before November 2552 - Four SPARTAN-III Headhunters deployed on Unidentified moon. All are confirmed KIA. July 24 to August 30, 2552 — NOBLE Team participates in the Fall of Reach. All but Jun-A266 are confirmed KIA. Concurrently, Spartan-IIIs are deployed to Casbah City on Tribute to assist civilian evacuation operations. September–October, 2552 — The majority of Gamma Company is deployed into combat, with only three fireteams remaining on Onyx to compete for top honors. October 2552 — Camp Currahee receives supplies for the upcoming SPARTAN-III Delta Company from the UNSC Agincourt. October 31, 2552 — November 3, 2552 — Onyx Conflict. The SPARTAN-III program is discontinued following the destruction of Onyx. Gamma Company is disbanded, with the bulk of the unit folded into Spartan Operations or shifted to non-combatant roles. By July 2553, Admiral Parangosky plans to assign the Spartans of Gamma Company to more classified roles to cover up their illegal brain mutations. The three survivors of Team Saber are officially designated KIA and reassigned to a top-secret "Ferret" black operations unit under agent Veta Lopis. The Ferrets would later work alongside Blue Team in December 2553 during Operation: RETRIBUTION to foil a bioweapon plot. By 2554 Spartans Lucy-B091 and Tom-B292 are assigned as security staff members on Trevelyan. January 21, 2558 - SPARTAN-G059 deployed in New Llanelli by ONI in order to assassinate Avu Med 'Telcam, the leader of the Servants of Abiding Truth. October 29, 2558— ongoing —Second Onyx conflict featuring Lucy-B091 and Tom-B292. Chief Mendez: "You've read Lord of the Flies, sir?" Kurt Ambrose: "I have, But your analogy will not hold. These children will have guidance. They will have discipline. And they have one thing no ordinary children have, not even the SPARTAN-II candidates. Motivation." Emile-A239 taunts a dead Skirmisher. The Spartan-IIIs are generally highly dedicated and goal-oriented. Much like the Spartan-IIs, their training emphasized duty as well as the importance of winning. Unlike with their predecessors, however, they had existing motivation upon which their indoctrination and training built as a result of their backgrounds as vengeful war orphans. The Spartans' motivation was a driving factor throughout the program: at least Alpha Company's training began with a test forcing the candidates (some of them only four years old) to perform a nighttime parachute jump to determine the extent of their willingness to participate in the program, and gruelling vetting processes were used to pick the 300 trainees to become Spartans out of Alpha and Beta companies' original rosters of 497 and 418 candidates, respectively. This was largely driven by practical concerns: the program was operating on a limited budget and did not have the funding to augment and equip every trainee. It also introduced an additional element of competitiveness to the program, with fireteams fiercely contending for the opportunity to become Spartans. Gamma Company's post-augmentation training also concluded in a competition for top honors, pitting the three best-ranked fireteams against one another. Many of the Spartan-III candidates were very lively and aggressive, to the extent that some initially doubted whether they could be trained into effective soldiers at all. However, the program was ultimately able to drill military discipline and teamwork into the trainees, and several improvements were introduced to the Spartan-IIIs' training over the program's successive generations to further ensure this. As in the SPARTAN-II program, teamwork and camaraderie among the trainees was both encouraged and developed naturally as a consequence of the Spartans' way of upbringing. As a result, the bonds among Spartan-III teams run extraordinarily deep; Kurt Ambrose described Spartan-III units as being "more family than fireteam", a sentiment echoed by the Spartan-IIIs themselves. The Spartan-IIIs' training regimen was designed to be tougher than that of the Spartan-IIs but was in many ways fashioned after that of the preceding program — complete with similar objective-oriented drills, including Ring the Bell. Many of their training exercises forced the trainees to improvise and think unconventionally, often pitting the Spartans-in-training against superior opponents with no weapons or armor. Like their predecessors, the Spartan-III trainees were given classroom lessons alongside their laborious combat training; the Spartan-IIIs' theoretical studies were overseen by ONI's resident AI at Zone 67. The Spartan-IIIs also studied the Spartan-IIs and their tactics, and many of the traditions developed by the Spartan-IIs were passed on to the Spartan-IIIs, including the plethora of gestures and signals they use to communicate silently. As one of the adjustments to the Spartan-IIIs' training over time, Kurt Ambrose placed supreme emphasis on teamwork with Beta Company as he attributed Alpha Company's destruction to the loss of unit cohesion. He also increased the severity of the training to the point of making AI Deep Winter concerned that the constant drills would break the children. However, Kurt was adamant that the hardships were necessary for the Spartans' survival in actual combat. Likewise, SCPO Mendez was assured that the trainees would not break due to their sheer tenacity and drive for success. The SPARTAN-III program was based in Camp Currahee on Onyx, with another facility for the further training of the Headhunters on the other side of the planet. The Spartan-IIIs' augmentation procedures were carried out aboard the hospital ship UNSC Hopeful, with entire decks emptied of regular personnel to ensure the program's utmost secrecy. The SPARTAN-III program was operated under the Office of Naval Intelligence's top-secret Beta-5 Division, with both the project staff and the Spartans themselves falling under the UNSC Navy. [note 1] At least Kurt Ambrose was officially assigned under the UNSC's Logistical Operations Command. Some of the Spartan-IIIs removed from their mainline companies served with other branches, although at least the members of NOBLE Team remained members of the Navy despite serving under the Army's operational authority. Most of the active Spartan-IIIs were folded into Spartan Operations following its establishment. The size and composition of the fireteams in the mainline Spartan-III companies was seemingly more established than in the Spartan-II program, with the Spartan-III teams training together since the companies' initiation and training. It appears that the number of members per team increased by one every generation, with Alpha's Team Wolf Pack having three members, Beta's Team Foxtrot having four, and Gamma's three top-ranked fireteams having five, for example. The two-member Headhunters and the irregularly sized non-company "cat 2" teams deviated from this norm, however. Robert-A057 - Confirmed KIA during Operation: PROMETHEUS. Was part of Team Wolf Pack. Shane-A112 - Confirmed KIA during Operation: PROMETHEUS. Was part of Team Wolf Pack. Jane-A203 - KIA during Operation: PROMETHEUS. Was part of Team Wolf Pack. Emile-A239 - Reassigned to Noble Team. KIA during the Battle of Asźod. Carter-A259 - Reassigned to Noble Team. KIA during the Battle of Asźod. Jun-A266 - Reassigned to Noble Team. Retired. Holding position of Chief of Staff of Spartan Operations as of October 2558. Thom-A293 - Reassigned to Noble Team. KIA during the Battle of Fumirole. Rosenda-A344 - Reassigned, unknown status. Team Echo - KIA during Operation: TORPEDO. Adam-B004 - KIA during Operation: TORPEDO. Lucy-B091 - Active as of 2554. Assigned as security staff member on Trevelyan. Min-B174 - KIA during Operation: TORPEDO. Tom-B292 - Active as of 2554. Assigned as security staff member on Trevelyan. Team India - KIA during Operation: TORPEDO. Team Lima - KIA during Operation: TORPEDO. Team X-ray - KIA after encountering Sentinels. Team Romeo - KIA during Operation: TORPEDO. SPARTAN-B312 - Reassigned to Noble Team. KIA following the Battle of Aszod. Kat-B320 - Reassigned to Noble Team. KIA during the Siege of New Alexandria. Team Gladius - KIA during the Onyx Conflict. Team Katana - Severely injured, inside slipspace field pods.. Status unknown following rescue and attempted medical attention. Holly-G003 - KIA during the Onyx Conflict. Dante-G188 - KIA during the Onyx Conflict. A Spartan donning SPI armor. Semi-Powered Infiltration armor (SPI) was the primary armor system used by the Spartan-IIIs. Though more advanced than the ODST combat suit, it is considerably less powerful than the Mjolnir armor. Its main benefit was that it is drastically cheaper to produce than the MJOLNIR armor. Although the SPI bodysuit features a ballistic layer of liquid nanocrystals which provides significantly more protection than conventional body armor, the armor is designed with an emphasis on stealth rather than raw power. It features photoreactive panels that mimic the surrounding textures, giving its wearer a rough approximation of active camouflage. It lacks the energy shielding of the later models of MJOLNIR armor, and a single hit from an enemy plasma weapon melts the suit's photoreactive panels, rendering its camouflage capabilities useless. By 2558, the SPI armor had been mostly phased out of use by Spartan-IIIs and was presumably replaced with MJOLNIR GEN2 armor. However, Team Saber, working as an ONI Ferret team under Veta Lopis, continued to use SPI armor for their covert missions rather than Mjolnir armor. Spartan-IIIs extracted from their companies were issued with the MJOLNIR Powered Assault Armor to improve their combat prowess. These included the Spartan-IIIs of NOBLE Team, who wore the first version of the Mark V in 2552. A variant of Mjolnir was designed specifically for Spartans serving in the Army's SPECWAR/Group Three: Mark V[B]. Post-war, MJOLNIR GEN2 armor is standard-issue for all Spartans serving in the Spartan branch, including former Spartan-IIIs. The Spartan-IIIs underwent enhancement procedures similar to those of the Spartan-IIs, but with higher success rates due to advancements in technology. The rate of survival went up from 44% for the Spartan-IIs to 100% for the Spartan-IIIs. The number of 300 Spartan-IIIs in both Alpha and Beta companies, who were both massacred but completed their missions and killed many Covenant warriors in the process is a reference to the fabled last stand of the 300 Spartans in the Battle of Thermopylae. The protagonist of Halo: Reach is SPARTAN-B312, a Spartan-III who was pulled from Beta Company right after training. Halo Reach concept art of Spartan-IIIs. Headhunters Roland-B210 and Jonah-B283 during a mission on an unidentified moon in Headhunters. A screen monitoring Carter-A259's status during Project CHRYSANTHEMUM in Birth of a Spartan. Carter undergoing his augmentation procedures. Carter receives his MJOLNIR armor. Kat-B320 and UNSC Soldiers charge against Covenant forces in Deliver Hope. Thom-A293 comes across a wounded Kat during the Battle of Fumirole. 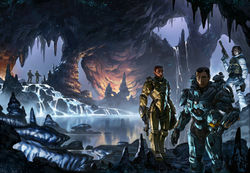 Artwork of Noble Team during the Fall of Reach for Halo: Reach. Jun-A266 sniping from a UH-144 Falcon. SPARTAN-B312 during a nighttime recon mission on Reach. Emile-A239 drawing his kukri in combat. Jun-A266 recruiting Sarah Palmer for the SPARTAN-IV program in Halo: Initiation. A Spartan-III engaging a Sangheili Minor in Halo Mythos. A Spartan-III and Fred-104 on Shield World 006. A Spartan-III of Blue Team during Operation: JOVIAN WHISTLE. Mark-G313, Fred-104 and Veta Lopis fighting off the Keepers of the One Freedom in Wendosa. Owen-B096 on the cover of Halo: Battle Born. ↑ Ash-G099 is referred to as a private on page 254 of Halo: Ghosts of Onyx. Since the rank of private does not exist in the Navy, this would ostensibly indicate Ash is a member of the Marine Corps or Army. Ash's rank is most likely an oversight, however, as all other personnel with known ranks involved in the SPARTAN-III program are part of the Navy, and the members of NOBLE Team maintained their Navy ranks despite being under the Army's operational control. Finally, in Halo: Glasslands, Chief Mendez explicitly mentions that the Spartan-IIIs are Naval personnel. ↑ See references under "Non-company teams". ↑ Halo: Reach Legendary Edition Letter "Dear Cousin"
↑ Halo: Ghosts of Onyx, pages 86, 89, 372, et al. ↑ 64.0 64.1 Halo: Fractures, "Lessons Learned"